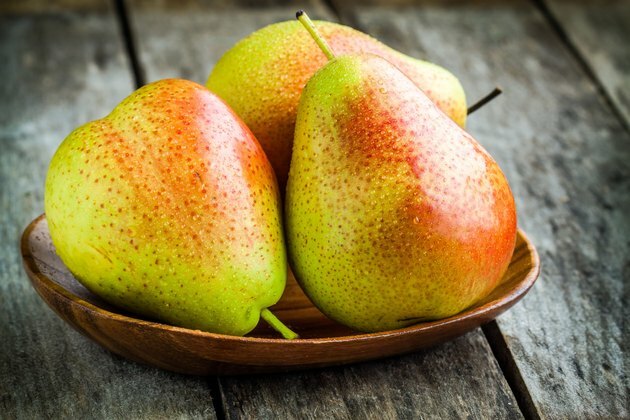 Bite into a juicy apple or a sweet pear and part of what you're eating is cellulose, a component of plant foods that is indigestible by the human body. It might not seem intuitive that something your body can't digest can benefit your health, but it can. Cellulose is a type of fiber called insoluble fiber, and its benefits include helping food move through your digestive system more quickly, thus preventing constipation, and reducing the risk of developing a condition called diverticular disease. The most abundant of all natural organic compounds, cellulose is a structural component of plant foods found in the cell walls of plants. About 33 percent of vegetable matter, 90 percent of cotton and 50 percent of wood is composed of cellulose. In addition to occurring naturally in the foods you eat, it is also used in the manufacture of paper, fabric, plastic and photographic film. You can also find it in the supplement aisle in powder form. Cellulose is considered insoluble because it does not bind with water nor change form in the digestive tract. Another type of fiber, called soluble fiber, does bind with water and become a gel-like substance -- that type of fiber serves different purposes in your body. Because insoluble fiber travels through your digestive system unchanged, it helps move waste through your digestive tract, which prevents constipation. Insoluble fiber is the type primarily responsible for preventing diverticular disease, a condition characterized by the development of pockets called diverticula along the colon wall. According to the Harvard School of Public Health website, diverticular disease is one of the most prevalent age-related conditions that affects the colon in Western society. Diverticulitis occurs when the diverticula become infected and inflamed. Diverticular disease is more common in people who don't eat enough fiber, according to the American Society of Colon & Rectal Surgeons website. Fiber recommendations include both insoluble fiber and soluble fiber. It is generally recommended that all adults consume at least 20 grams of dietary fiber per day; however, the Harvard website explains that your fiber needs are proportionate to your calorie intake -- the more calories you eat, the more fiber you need, so men may need 30 to 35 grams each day. The best sources of cellulose are seeds like hemp and flax as well as whole grains, carrots, tomatoes and cucumbers. If you eat a variety of fruits, vegetables, whole grains, nuts and seeds, you are more likely to get the cellulose you need to stay healthy.